Performance profiling is a fantastic way for coaches and athletes to identify and understand areas which require improvement and maintenance. It enables individuals to look at skills and qualities which they believe are essential for athletic performance. Performance profiling engages with the athlete as it allows them to have a more active role in the decision making process. It is an effective process in raising an individual’s awareness about their current state and how they can implement intervention programmes to improve it. As well as this it allows the coach and other staff to understand the individuals self perception of what they think their current rating is and how well they believe they are performing. Not only can the athlete fill in the profile but the coach can also rate the individual on the profile so the performer can learn more about how the coach views them. As well as this a team can also profile their overall performance or you can look at factors around team cohesion. Finally if you are a coach you can even use this great tool on your own coaching. It is a great tool for increasing self awareness, evaluating performance and enhancing communication between both the athlete and coach. Below is a picture of what the performance profile looks like. In this picture we have put in various psychological qualities that can be assessed. 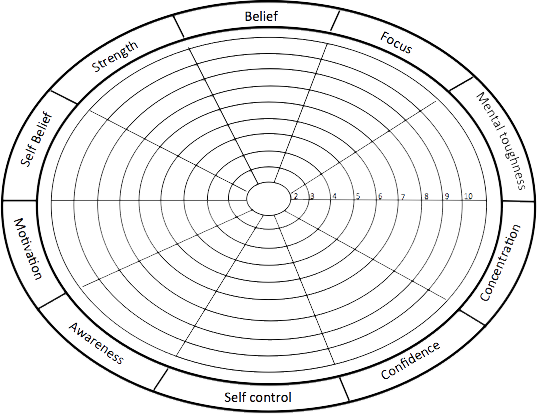 This tool is not just for the area of sport psychology and can also be used for assessing the physical, technical and tactical skills of an athlete. For example you could look at the performance profile of a defender and include attributes such as heading, awareness, tackling, defending and many more.